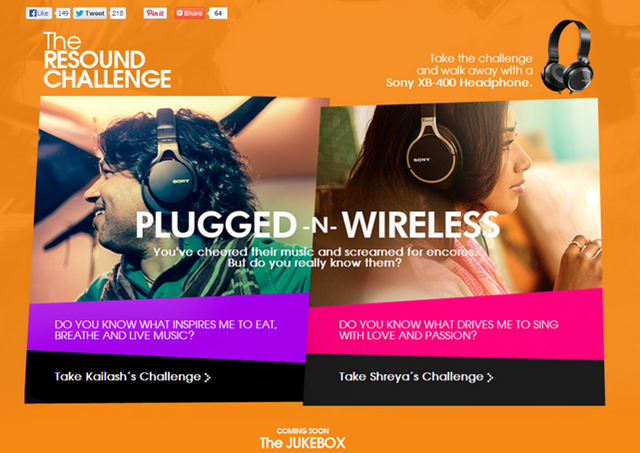 Sony India today launched its dedicated Microsite for its home audio video products. To promote this event it has also organized a web concert where, Kailash Kher and Shreya Ghoshal, two widely known singers with huge fan following, will come together and spread the message of “upgrade your ears”. The microsite will serve as a platform for the people to participate in the upcoming Sony Live Web Concert. “We’d like to inspire young people to upgrade their ears by using Sony headphones. It will enable them to enjoy sound quality as recorded in a studio.” said Kailash Kher. These singing superstars will do a series of webisodes to showcase their journey and discover the need for upgrading your ears. During the course of their journey they will compose a song and highlight the efforts that go into creating a quality music/song and importance of devices which makes difference in music quality which will be later streamed as part of the concert. You can watch the streaming of this concert here . And post your comments and feed bacl through #ProjectResound on Social Platforms. To further engage users their will be Quiz contests based on the webconcerts, AR app from Shreya & Kailaish greetings fans and sharing the signed Photograph. “For the past two years, I have been craving to do something different, the kind of sound and experimentation you don’t get in the daayra of Bollywood. It’s only when you get this kind of independence that your music takes flight.” said an enthusiastic Shreya Ghoshal.